Repeat again: ventilation. We tend to believe that all windows should be operable. Regardless of where you live, there are times of the day and times of the year when the outside temperature and humidity are comfortable. Fresh air can provide numerous health benefits, and the sounds and smells allow us to be a little closer to nature, even as we stay inside our sheltered home. We talked about the importance of determining the direction of prevailing breezes and selecting a building site that could take advantage of passive ventilation strategies. These strategies should be a part of every good green home design. But for those breezes to really provide cooling for the home, the design must incorporate elements to promote air circulation through the building. Windows, depending on location, can be used for cross ventilation, circulating natural breezes throughout the home, and stack ventilation, exhausting heat out through stairwells, monitors, cupolas or upstairs rooms. 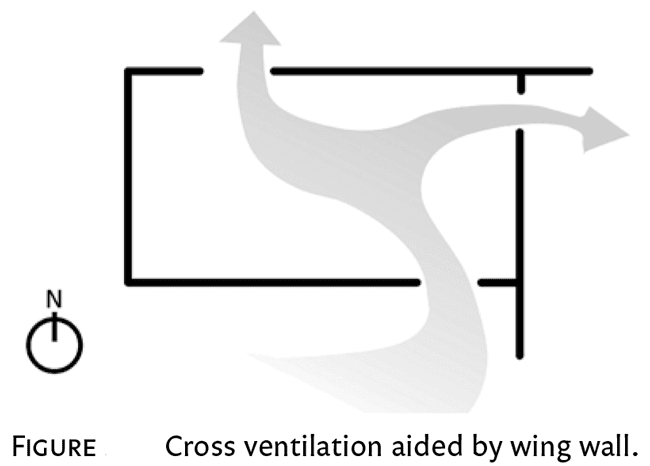 However, prevailing winds can be impeded by a number of factors, including adjacent structures and topography that either block the air ow or change its direction at window level. But if we can get above the obstruction, we can use our roof design as a scoop to channel the wind back down into the building. Wing walls can also accomplish this at ground level, if we can capture the breeze coming around the neighboring impediment and direct it back toward our other architectural features that are designed to capture it. Investing in these kinds of architectural details will pay o over the long run by reducing your mechanical cooling costs. We can also use natural ventilation strategies instead of running our air conditioners, thereby lowering our utility costs. Open windows can reduce our need to use mechanical ventilation appliances, like bath and kitchen exhaust vents. Opening the windows can also improve indoor air quality by exhausting stale, contaminated air, allowing us to temporarily shut o our mechanical fresh air systems. Opening the laundry room windows can provide a source for make-up air for the clothes dryer, preventing negative pressure that might bring in air from unwanted sources. It is important to note, however, that operable windows should not be considered as a replacement for mechanical ventilation systems. ink about how o en you actually open your windows or how many days each year passive ventilation is a viable option for you. We will discuss indoor air quality and how to manage indoor air pollutants in your home. 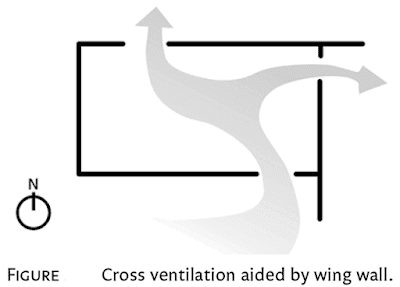 Mechanical ventilation is a necessary component of healthy indoor air quality. More than that, mechanical ventilation is a mandatory requirement in the 2012 International Residential Building and Energy codes. e paradigm is to build them tight and then ventilate them right! We will have more to say on the equipment to use and how to provide ventilation in the different climate zones in our country in Chapter 6. Yes, climate makes a big difference in how ventilation should be done.